Skooba Design advertises its Harmony Collection line of laptop and iPad bags as “designed by women, for the way women really work and travel.” I recently had the chance to test out the $100 Harmony iPad/Netbook Satchel, and while the bag features several interesting design flourishes, the overall look and feel leaves something to be desired. 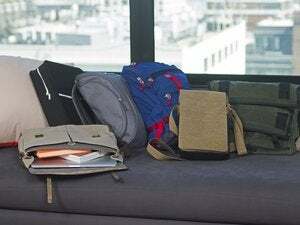 While pitched as a bag for smaller electronic devices such as an iPad or netbook, the iPad/Netbook Satchel itself is enormous: 14.5 inches wide, 12 inches tall, and five inches deep. It features a generous eight pouches and pockets of various shapes and sizes, in addition to the bag’s prodigiously-sized main compartment. Those pouches and pockets include a zippered pocket on the bag's front flap; a Velcro-closure pouch in the rear for documents; and another zippered pocket under the flap (on the body of the bag). Inside the bag, along with a few pen holders, you'll find five cloth pockets. One holds a power charger or cables and uses elastic to close, while three are simple, cloth pouches with no closures. The fifth is larger and holds a book or an iPad—or both—and sports a Velcro closure. An 11-inch or 13-inch MacBook Air can even fit with ample room, though I'd recommend encasing the computer in some sort of sleeve if you plan on sharing the space between multiple items. The bag itself is made out of “betcha’ can’t tell it's faux” leather (spoiler: yes, you can) and quilted-nylon fabric, with striped-cloth lining inside. The Satchel’s strap is made of the same faux leather and can be adjusted using belt buckles on either side, but it's much too thin—with only a few items in the bag, the strap’s flimsy construction is immediately apparent. In my testing, it was incredibly uncomfortable to carry the bag, and I can’t imagine traversing very far (or using any form of public transportation) with the Satchel on my shoulder. If you need a catch-all bag, and functionality isn't your top priority, the Satchel might be worth a look. But you can do better.